<b>SCARY GOOD:</b> Jillian McDonald’s three-panel video installation is just one part of <i>Valley of the Deer</i>, her horror-film-based multimedia exhibit that is currently on display at SBCC’s Atkinson Gallery. Just in time for the film festival, and easily taking the prize for quirkiest art exhibition of the season, Jillian McDonald’s Valley of the Deer, which will be at SBCC’s Atkinson Gallery through February 20, uses multiple media, including futuristic, smartphone-based augmented reality, to embed visitors in the landscape of an enigmatic imaginary horror film. McDonald, who teaches art at Pace University and divides her time between New York and Canada, has been haunting the horror movie genre in her art for more than a decade. In that time, she has gone from relatively simple concepts, such as drawing the scenes of graphic violence from slasher films on paper or editing found video from vampire movies together to create hilarious “staring contests,” to increasingly complex and elaborate projects of which Valley of the Deer is the latest. Thanks in part to an artist’s residency at the Glenfiddich Distillery (how good does that sound? ), Valley of the Deer is McDonald’s most ambitious installation to date. Based on extensive original video footage she shot of Scots wearing ordinary clothes and a variety of animal masks, Valley invests the strikingly beautiful woods and barley fields of Scotland with a dreamy menace. 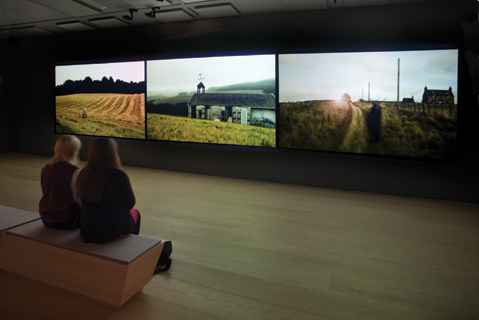 The show deploys this footage through a slowly evolving three-panel video projection in the gallery’s main space. McDonald has covered the opposite and sidewalls of the room with her drawings of the figures from the film, some at life scale or larger and directly on the walls, others in miniature on sheets of paper. Finally, and most spectacularly, she has added another dimension to the installation through the use of augmented-reality technology. By downloading an app called Layar, visitors to the show can use the camera on their smartphone to view an otherwise invisible set of images that appear through the phone to be present both in and beyond the gallery space. By stepping onto the deck of the gallery, one can access several images that seem to be floating in the outside environment, some at considerable distances. On the night of the show’s opening, some of the fantastic elements that McDonald had created could be seen through the various phones people were holding to be sitting alongside the grand cruise ship Princess that happened to be moored in Santa Barbara’s harbor that evening. This is the same technology that is driving Microsoft’s new HoloLens eyeglass project, and there’s little doubt that we will be seeing much more of it, and through it, in the very near future. For the young art students who gathered for McDonald’s preopening lecture, the connection she makes to horror movies posed something of a riddle. Having grown up in a culture where traditional distinctions between high and low art forms have long since faded, they were caught off guard by the artist’s reluctance to aspire to making horror films of her own. Where 20 years ago, a project that made fine art out of horror might have been shocking, today it is the other way around, with the prestige of the movies eclipsing any sense that even such schlock like The Slumber Party Massacre could possibly represent anything less than having arrived. Despite this momentary glitch in what was otherwise a seamless scene of consumption, McDonald, aided in no small part by her adoption of smartphone-friendly augmented reality, has a hit on her hands with Valley of the Deer.